Prairie Ridge (4-0) defeated Jacobs (3-1) in three sets to remain undefeated in conference play Tuesday, September 18, 2012 at Prairie Ridge High School in Crystal Lake. Mike Greene - mgreene@shawmedia.com Prairie Ridge's Taylor Otto (right) goes to spike the ball as Jacobs' Rachel Arceneaux attempts to block the shot during the first set of a conference match Tuesday, September 18, 2012 at Prairie Ridge High School in Crystal Lake. 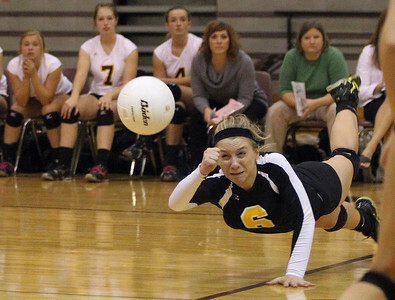 Prairie Ridge (4-0) defeated Jacobs (3-1) in three sets to remain undefeated in the conference. Mike Greene - mgreene@shawmedia.com Prairie Ridge's Alit Witt (left) and teammate Caitlin Brauneis attempt to block a shot from Jacobs' Jenna Bilgrien during the first set of a conference match Tuesday, September 18, 2012 at Prairie Ridge High School in Crystal Lake. 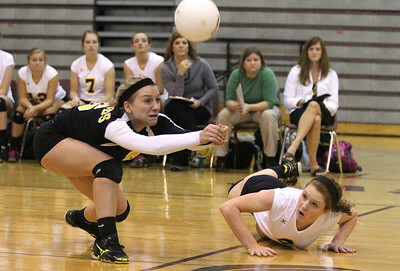 Prairie Ridge (4-0) defeated Jacobs (3-1) in three sets to remain undefeated in the conference. Mike Greene - mgreene@shawmedia.com Prairie Ridge's Paige Dacanay digs a serve during the first set of a conference match against Jacobs Tuesday, September 18, 2012 at Prairie Ridge High School in Crystal Lake. 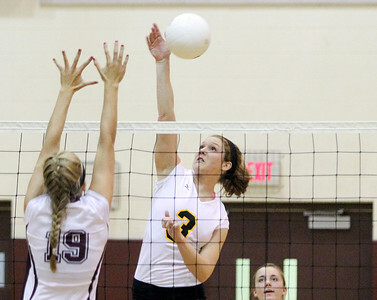 Prairie Ridge (4-0) defeated Jacobs (3-1) in three sets to remain undefeated in the conference. Mike Greene - mgreene@shawmedia.com Prairie Ridge's Nicole Kirchberg (right) goes in front of teammate Paige Dacanay to bump a serve during the first set of a conference match against JacobsTuesday, September 18, 2012 at Prairie Ridge High School in Crystal Lake. 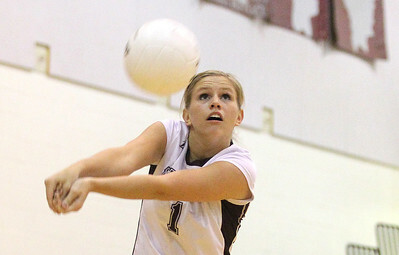 Prairie Ridge (4-0) defeated Jacobs (3-1) in three sets to remain undefeated in the conference. Mike Greene - mgreene@shawmedia.com Prairie Ridge's Caitlin Brauneis bumps the ball during the second set of a conference match against Jacobs Tuesday, September 18, 2012 at Prairie Ridge High School in Crystal Lake. 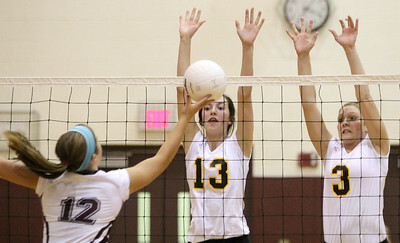 Prairie Ridge (4-0) defeated Jacobs (3-1) in three sets to remain undefeated in the conference. Mike Greene - mgreene@shawmedia.com Jacobs' Mackenzie Traub (left), Alyssa Ehrhardt, and Kassie Kasper celebrate winning a point during the second set of a conference match against Prairie Ridge Tuesday, September 18, 2012 at Prairie Ridge High School in Crystal Lake. Prairie Ridge (4-0) defeated Jacobs (3-1) in three sets to remain undefeated in the conference. Mike Greene - mgreene@shawmedia.com Jacobs' Katie Mahoney (center) and teammate Alyssa Ehrhardt (right) attempt to block a shot by Prairie Ridge's Mackenzi Humm during the second set of a conference match Tuesday, September 18, 2012 at Prairie Ridge High School in Crystal Lake. Prairie Ridge (4-0) defeated Jacobs (3-1) in three sets to remain undefeated in the conference. Mike Greene - mgreene@shawmedia.com Jacobs' Alyssa Ehrhardt (right) goes to spike the ball as Prairie Ridge's Alit Witt attempts to block during the second set of a conference match Tuesday, September 18, 2012 at Prairie Ridge High School in Crystal Lake. 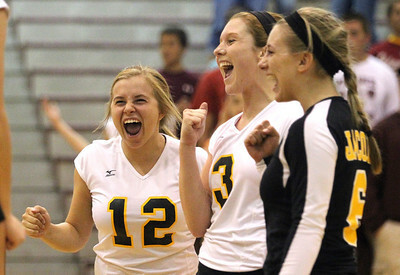 Prairie Ridge (4-0) defeated Jacobs (3-1) in three sets to remain undefeated in the conference. 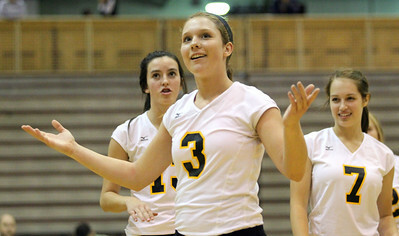 Mike Greene - mgreene@shawmedia.com Jacobs' Alyssa Ehrhardt argues a point during the second set of a conference match against Prairie Ridge Tuesday, September 18, 2012 at Prairie Ridge High School in Crystal Lake. 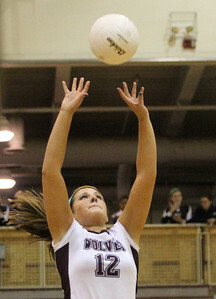 Prairie Ridge (4-0) defeated Jacobs (3-1) in three sets to remain undefeated in the conference. Mike Greene - mgreene@shawmedia.com Prairie Ridge's Mackenzi Humm sets the ball for a teammate during the third set of a conference match against Jacobs Tuesday, September 18, 2012 at Prairie Ridge High School in Crystal Lake. Prairie Ridge (4-0) defeated Jacobs (3-1) in three sets to remain undefeated in the conference. Mike Greene - mgreene@shawmedia.com Jacobs' Kassie Kasper dives to save a ball during the third set of a conference match against Prairie Ridge Tuesday, September 18, 2012 at Prairie Ridge High School in Crystal Lake. Prairie Ridge (4-0) defeated Jacobs (3-1) in three sets to remain undefeated in the conference. Mike Greene - mgreene@shawmedia.com Prairie Ridge's Taylor Otto dives to save the ball during the third set of a conference match against Jacobs Tuesday, September 18, 2012 at Prairie Ridge High School in Crystal Lake. Prairie Ridge (4-0) defeated Jacobs (3-1) in three sets to remain undefeated in the conference. Mike Greene - mgreene@shawmedia.com Jacobs' Kassie Kasper (left) bumps the ball as teammate Alyssa Ehrhardt (right) watches after diving for the shot during the third set of a conference match against Prairie Ridge Tuesday, September 18, 2012 at Prairie Ridge High School in Crystal Lake. Prairie Ridge (4-0) defeated Jacobs (3-1) in three sets to remain undefeated in the conference. 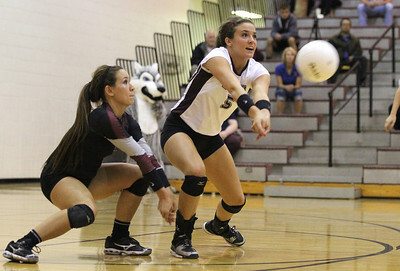 Prairie Ridge's Nicole Kirchberg (right) goes in front of teammate Paige Dacanay to bump a serve during the first set of a conference match against JacobsTuesday, September 18, 2012 at Prairie Ridge High School in Crystal Lake. 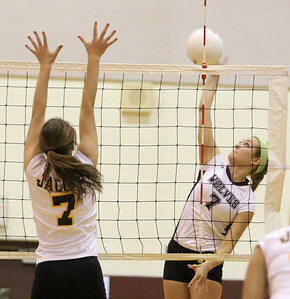 Prairie Ridge (4-0) defeated Jacobs (3-1) in three sets to remain undefeated in the conference.